The Zebra ZXP Series 7 ID card printer is built to print stunning cards and badges in high volume. Zebra� ZXP7 Single- or Dual-Sided High-Speed Direct-to-Card ID Printer/Encoder affordable meets medium- to high-volume card-production needs with professional easy-to-use results for organizations regularly printing employee IDs, visitor, event or membership badges, or access-control badges. Built for heavy use, it simultaneously prints, encodes and laminates with first-class near-photographic print quality (vibrant color or monochrome), a built-for-growth modular design, optional magnetic-stripe and smart-card encoding, advanced security features, and Ethernet connectivity. It�s a high-value tool for governments, education, retail, healthcare, and hospitality businesses. 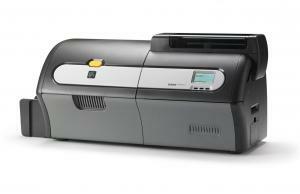 WHAT ARE THE MAIN SPECIFICATIONS OF THE ZEBRA ZXP SERIES 7 ID CARD PRINTER? 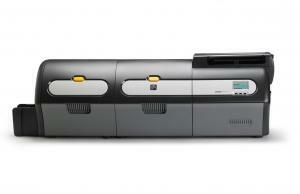 WHICH LAMINATES ARE AVAILABLE FOR THE ZEBRA ZXP SERIES 7 ID CARD PRINTER? The Zebra ZXP Series 7 ID card printer is designed to work with Zebra True Secure i Series laminates. Easy to load and ultra-secure, these secure varnish overlays and laminates are particularly effective to fight against card counterfeiting, alteration and duplication. Clear laminates: a clear protective layer of 1.0 mil is applied to your printed cards to protect them from wear and tear. Top and bottom laminates are available in rolls of 750 imprints. Standard holographic laminates: choose laminates with holograms for added security as holograms are hard to duplicate. Custom holographic laminates: instead of opting for a standard hologram that another company may also use, go for your own custom design. This option guarantees maximum protection to your cards. If you are using technology cards, choose laminates for magnetic stripe, magnetic stripe with signature panel, or smart cards. WHICH OPTIONAL FEATURES CAN I ADD TO MY ZEBRA ZXP SERIES 7 ID CARD PRINTER?